This year's freebie is a log cabin and a stable. As with past years, I have tried to make low prim little builds for this season of giving. This year, however, real life has changed a lot for me and I don't have as much time to spent in SL. So this year, while I was building Teddy's Log Cabin and Stable, I have decided not to try building any low prim freebie houses. 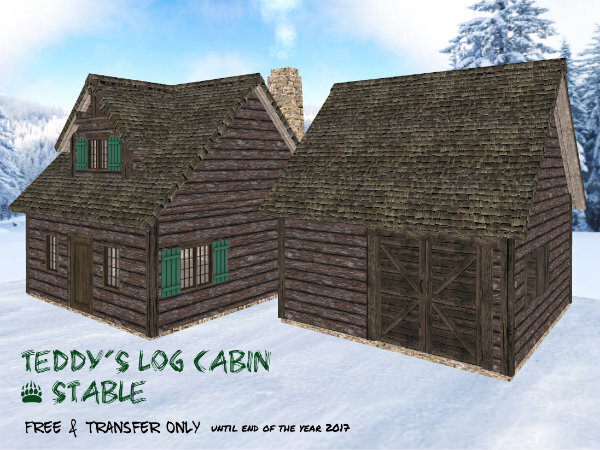 Instead, Teddy's Log Cabin and Stable is this year's freebie but only till the end of the year 2017. It is TRANSFER ONLY. Once the year is over, I will be reverting Teddy's Log Cabin and Stable to copy and modifiable plus I will be adding the landscaping the way I have already imagined in my mind and selling it. Well, that is my plan, but as with all plans, things might change. Teddy's Log Cabin is a cute little cabin with a loft and dormer while Teddy's Stable can fit a couple of horse and a foal. I made the stable to specifically fit the ABC horses coz they are really BIG horses. Please get them at my in-world store. They are set at 0L with the other freebies on the wall. I won't be putting them in the Marketplace. These are some of my pretty Gypsy Vanners Silver Tobiano Snowflakes. I wanted them to pull a sled in the snow, but I just don't have time to make that happen:( So all they can do are hang around in the snow with Moon infront of the freebie cabin and stable. I hope you enjoy the Cabin and Stable! Have a wonderful HOLIDAY and may next year be even better than this year!!! !